LINCOLNSHIRE, Ill. -- Aug. 9, 2016 -- Zebra Technologies Corporation (NASDAQ: ZBRA), a global leader in providing solutions and services that give enterprises real-time visibility into their operations, today announced results for the second quarter ended July 2, 2016. Net sales for the three months ended July 2, 2016, were $879 million, compared with $890 million for the second quarter of 2015. The net loss for the second quarter of 2016 was $49 million, or $0.95 per share, compared with $77 million, or $1.50 per share, for the second quarter of 2015. Adjusted net sales were $882 million, compared to $894 million in the second quarter of 2015; and adjusted gross margin was 46.4% in the second quarter of 2016 compared to 44.5% in the second quarter of 2015. Both adjusted net sales and gross margin exclude the impact of purchase accounting adjustments in 2016 and 2015. Operating expenses for the second quarter of 2016 were $384 compared to $407 million in the prior year’s second quarter. Operating expenses for the second quarter of 2016 include $39 million in acquisition and integration costs and exit and restructuring costs, versus $49 million in the prior year quarter, as well as $60 million for amortisation of intangible assets, compared with $63 million for the second quarter of 2015. Adjusted (non-GAAP) metrics exclude these specific operating expense items. Non-GAAP net income was $70 million, or $1.34 per diluted share, compared with $53 million, or $1.03 per diluted share, for the second quarter of 2015. Adjusted net sales in the Enterprise segment accounted for $577 million compared to $574 million in the second quarter of 2015. Legacy Zebra segment net sales were $305 million compared to $320 million in the second quarter of 2015. On a constant currency basis, and excluding the purchase accounting adjustments, second quarter year-over-year adjusted net sales declined 0.3%, with the Enterprise segment growing approximately 1%, and the Legacy Zebra segment declining by approximately 3%. Adjusted gross margin for the quarter was 46.4%, compared to 44.5% in the prior year period, and reflects an increase primarily due to favourable changes in sales mix, improved margin on services, product cost reduction initiatives, and reductions in other costs. Adjusted EBITDA for the second quarter of 2016 was $144 million, or 16.3% of adjusted net sales compared to $131 million, or 14.6% of adjusted net sales for the second quarter of 2015, primarily due to higher gross margin and lower operating expenses, partially offset by unfavourable foreign currency changes versus the prior year period. Tax adjustments and estimation changes related to profitability mix by jurisdiction had an approximate $0.14 positive impact to non-GAAP earnings per share in the second quarter of 2016. As of July 2, 2016, the company had cash of $141 million and total long term debt of $2.9 billion. For the first half of 2016, the company made $99 million in scheduled cash interest payments and $145 million in term loan principal payments. For the first half of 2016, the company generated $122 million of cash flow from operations and incurred capital expenditures of $35 million. The company continues to expect full year 2016 net sales, excluding purchase accounting adjustments, to change approximately (3)% to 1% from the comparable net sales of $3,668 million for the full year 2015. This view reflects an expectation of year-over-year growth of (2)% to 2% on a constant currency basis. Adjusted EBITDA margin is expected to be approximately 17% for the full year 2016. The company expects to pay down $300 million of debt principal in 2016. The company expects third quarter 2016 adjusted net sales to decline approximately (3)% to 0% from the comparable net sales of $919 million in the third quarter of 2015. This expectation reflects year-over-year growth of (2)% to 1% on a constant currency basis. Adjusted EBITDA margin is expected to be approximately 17% for the third quarter 2016. 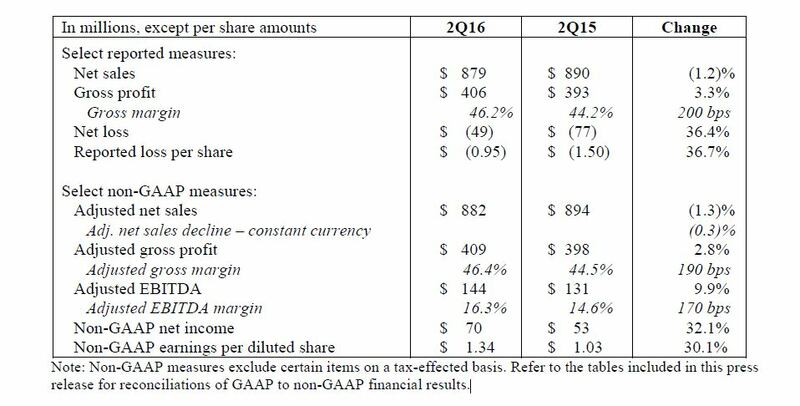 Non-GAAP earnings are expected to be in the range of $1.30 to $1.50 per share. Investors are invited to listen to a live webcast of Zebra’s conference call regarding the company’s financial results for the second quarter of 2016. The conference call will be held at 7:30 a.m. Central Time (8:30 a.m. Eastern Time) today. To view the webcast, visit the investor relations section of the company’s website at investors.zebra.com. This press release contains certain Non-GAAP financial measures, consisting of “adjusted net sales”, “adjusted gross profit”, “EBITDA,” “Adjusted EBITDA,” “Non-GAAP net income” and “Non-GAAP earnings per share” in addition to measure our operating performance. Management presents these measures to focus on the on-going operations and believes it is useful to investors because they enable them to perform meaningful comparisons of past and present operating results. The company believes it is useful to present Non-GAAP financial measures, which exclude certain significant items, as a means to understand the performance of its ongoing operations and how management views the business. Reconciliations of net sales to adjusted net sales, gross profit to adjusted gross profit, operating income to EBITDA, EBITDA to Adjusted EBITDA, and GAAP net income to Non-GAAP net income are included in the financial schedules contained in this press release. These measures, however, shouldn't be construed as an alternative to any other measure of performance determined in accordance with GAAP.